"He’s been a scorer since the day he walked on campus." That's the way Central Arkansas coach Russ Pennell describes Jordan Howard, who's made himself into an NBA draft sleeper. The Pauley Pavilion crowd hushed. No. 23 UCLA nursed a two-point lead over pesky visitor Central Arkansas, only 5.9 seconds separating the Bruins from victory. Just one defensive stop away, the entire gym knew the ball was going to Jordan Howard. The senior guard had blitzed UCLA all evening with acrobatic darts to the rim and flamethrowers from way beyond the three-point line. A screener from the left block flashed up to Howard’s man, and the rest is, well, textbook Central Arkansas under head coach Russ Pennell. The bucket ultimately forced overtime, where Howard continued to torch the Bruins—in defeat—for 10 more points. He finished with 35 on 8-15 shooting from deep and firmly planted himself on the NBA radar. Four teams have since contacted Pennell directly, not including the bevy of scouts in attendance and those who also took in Howard’s season-opening 22 points at Baylor. For a 5’11” senior Mid-Major guard, that’s the exact recipe for getting noticed at the pro level. Kudos to Pennell for scheduling a daunting non-conference schedule; the Bears will also visit Cal and Oregon in December. Howard’s long-bombing will travel wherever Central Arkansas visits. He’s posted a career 42% clip from downtown thus far. His younger brother Markus lead the nation in three-point shooting at Marquette as a freshman. Sniping is in their blood, but Howard is dangerous at all three levels of the half court. “He’s been a scorer since the day he walked on the campus,” Pennell says. 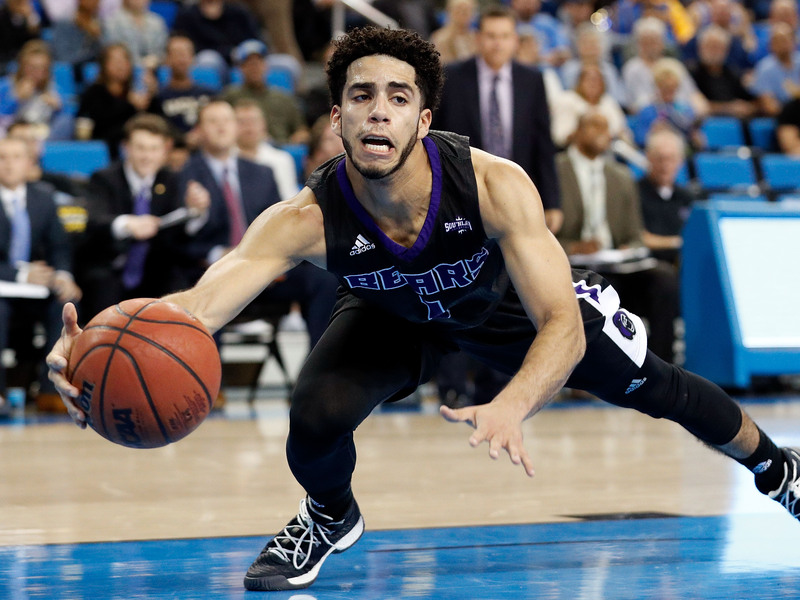 Let’s take a closer look at Central Arkansas’ potential NBA Draft sleeper. Credit to Pennell’s play calling, but the Bears largely got Howard an open look because of the shooter himself. He’s insanely slippery, and it’s a nightmare for opposing guards to chase him around screens. UCLA’s Aaron Holiday is a menace, one of the best point guard defenders in the nation, and Howard often left him dizzy scurrying around the arc. For a high-volume scorer, he’s a capable and willing passer. Struggling just 4-16 from the field against Morehead State on Monday, Howard dished 11 helpers. That playmaking ability, coupled with a remarkable ability to score without set actions, is a combination most NBA teams would love to have stashed on their bench. For all the havoc Howard causes flying around off the ball, teams will question his ability to handle in pick-and-rolls. He only runs pick-and-roll action 12.8% of his possessions, according to Synergy Sports. That’s a rate on par with bench NBA combo guards like Langston Galloway and Bryn Forbes. Frankly, using Howard on the ball makes defenses’ jobs far easier. “What they do is, they’ll either high hard-hedge and make him give the ball up—which, we really don’t want him to do—or they’ll trap him and make him give the ball up,” Pennell says. Howard is comfortable making those reads. It’s something he and the coaching staff have studied throughout his four years, with a greater emphasis this season as he prepares for life after college. Howard regularly watches tape of NBA guards running those high actions. Scouts will be curious to see him in that role against two scheduled Pac-12 opponents and on the workout circuit in June. Will a DraftExpress Lawsuit Change the World of Video Highlights? “How tall is he, really?” one scout texted The Front Office. Howard’s not shy about that. “I’m official 5’11”,” he says. “They could give me the 6’0” if they were being generous, but we like to be honest around here.” Should that ring true, it’s a huge asset for the senior. Far too many diminutive guards who are listed at or around 6’0” show up to the combine or a team’s workout and really measure 5’9” in socks. He’s also added more muscle this season—Pennell says 10 pounds—which will be imperative for finishing around the basket. As a junior, Howard scored just 51.1% of tries around the basket. Bigs often volleyballed his layups off the backboard. This season, he’s converted 64.7% of his 17 attempts around the rim, including a ridiculous finish over UCLA 7-footer Thomas Welsh. Part of it has to do with his sturdier frame. Part of the success is a greater dexterity in the midrange, as Howard drilled 10-foot runners and an array of floaters this summer. He’s also four years in on learning how to challenge bigs. “Whenever I get past the initial man and I see a big about to load up—if he’s taking a strong step towards the basket or double-planting and trying to go up for the block—I’ll try and read and react to where he’s headed,” Howard says. But Welsh isn’t exactly a fearsome rim protector and the Southland Conference isn’t loaded with 7-foot behemoths patrolling the paint. Teams will continue to question Howard’s ability to finish amongst the trees until he can prove them wrong against elite competition.